Head and shoulders portrait of a praying woman. Copy of a painting by Perugino, n.d.
Oil on canvas, 19,5 x 15,5 cm. Like the German Nazarene movement, J.L. Lund found his inspiration in Late Gothic art and the works of the early Renaissance masters. In his student years, the artist worked intensely on painting copies of works by the Renaissance painters Fra Angelico and Perugino. These copies would later be used for educational purposes at the Danish Royal Academy of Art. 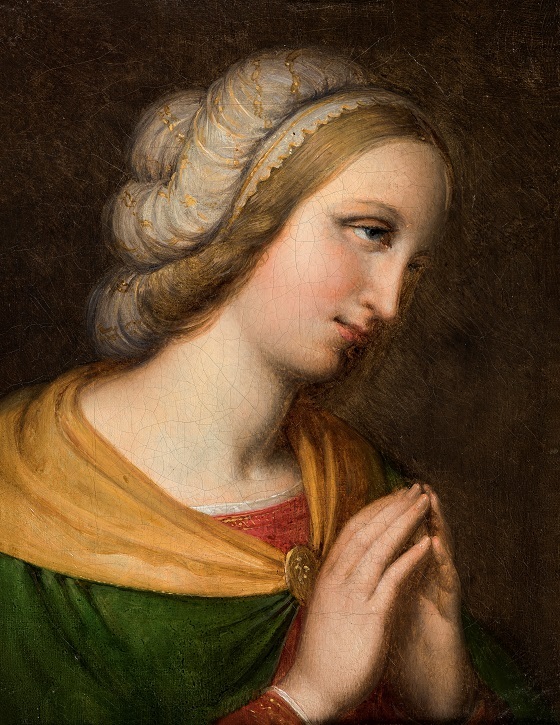 It was during one of his stays in Rome that the artist completed this head and shoulders portrait of a young woman in prayer, which likely stems from a larger religious scene painted by Perugino. The study is characterised by a mild and harmonious colour scheme which is very similar to the Italian master’s painting technique. The young artist’s fascination with Italian art persisted throughout his life, and came to influence the numerous altarpieces he painted in his later career.